Note: See the new version of Ancillary. Ancillary was born as a personal tool used to solve forensic challenges. Eventually it was improving and I realized that people were asking me for the program. Seeing that it was a useful tool, I decided to share it with the community and finally I decided to publish it. The program only process uncompressed files. 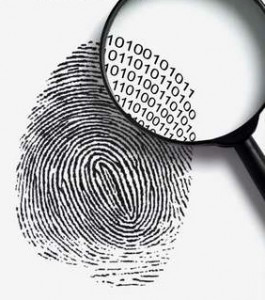 If you suspect that the file is compressed or encrypted first solve this trouble and then process with Ancillary. There are two modes for process files, automatic and manual. In AUTO mode we only have to load the file to process and select “smart recovery” or “I’m hungry”. The smart recovery option loses less time processing the file because it associates the headers and tails automatically. The “I’m hungry” option retrieves all the possible files combining all headers with all tails. 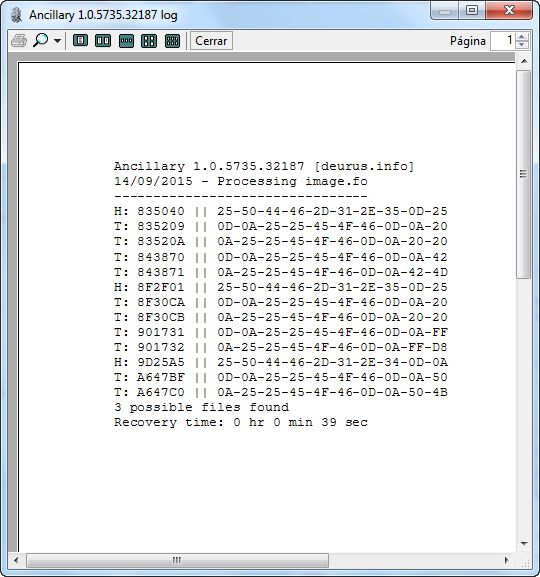 This latter mode recovers some trash or unreadable files. In MANUAL mode, the program retrieves all the headers and tails that found in the file and collets the offsets in two lists that we can combine as we like even deleting and adding offsets. Open or drag and drop the file to process. Select the type of file to recover. 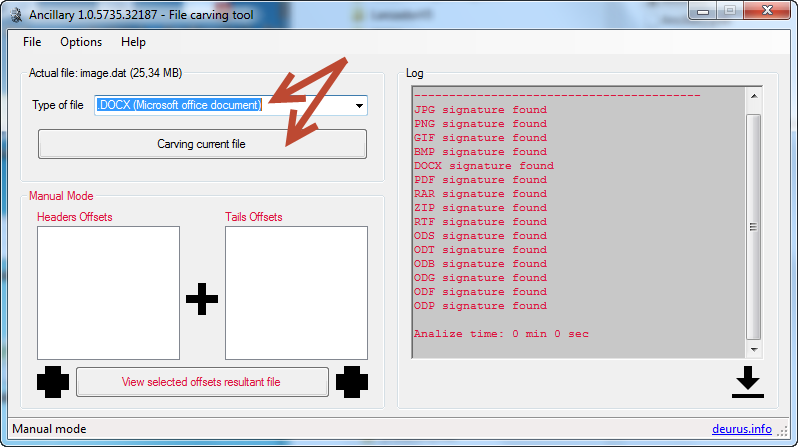 Push “Carving current file” button and wait finalize the process. 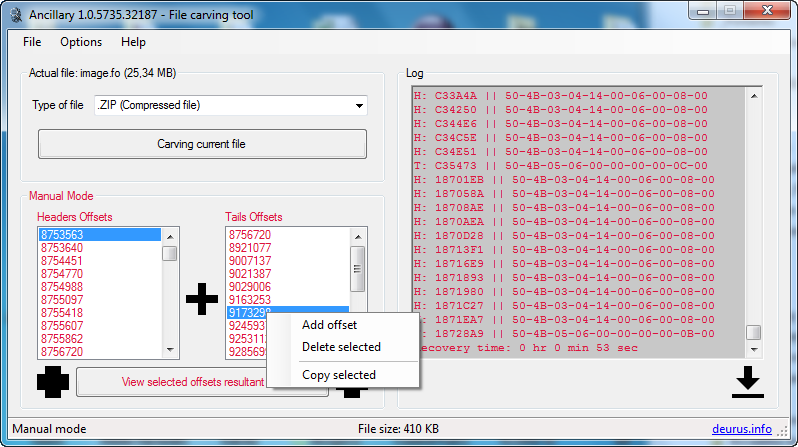 Finally show the recovered files at output folder clicking the indicated button. Open or drag and drop the file to process and change to manual mode. 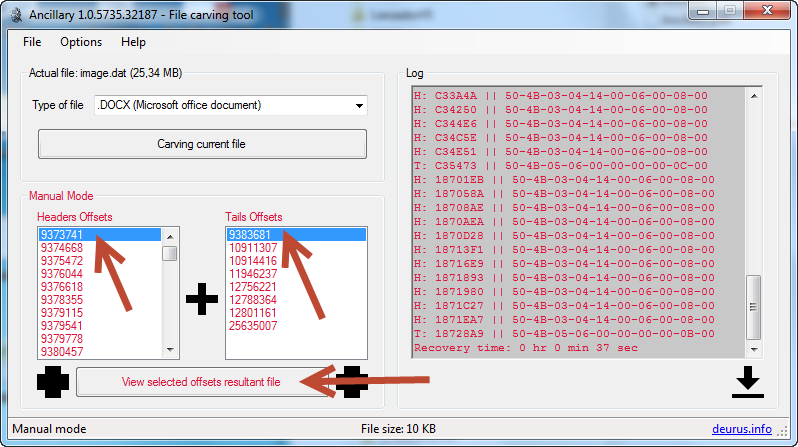 Select the type of file what you want to recover and push “Carving current file”. Select the header and the tail and push “View selected offsets resultant file”. The resultant file should be opened. Ancillary at present works with 15 type of files like JPG, PNG, GIF, BMP, RAR, ZIP, DOCX, RTF, PDF, ODS, ODT, ODB, ODG, ODF and ODP. 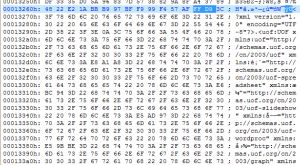 Tail: 50 4B 05 06 (PK..) followed by 18 additional bytes at the end of the file. 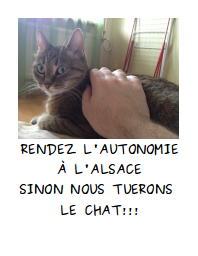 At the moment the license is FREEWARE but in the future will be FREE SOFTWARE. ANCILLARY IS PROVIDED “AS IS”, WITHOUT WARRANTY OF ANY KIND, EXPRESS OR IMPLIED, INCLUDING BUT NOT LIMITED TO THE WARRANTIES OF MERCHANTABILITY, FITNESS FOR A PARTICULAR PURPOSE AND NON INFRINGEMENT. IN NO EVENT SHALL THE AUTHORS OR COPYRIGHT HOLDERS BE LIABLE FOR ANY CLAIM, DAMAGES OR OTHER LIABILITY, WHETHER IN AN ACTION OF CONTRACT, TORT OR OTHERWISE, ARISING FROM, OUT OF OR IN CONNECTION WITH THE SOFTWARE OR THE USE OR OTHER DEALINGS IN THE SOFTWARE. If you have any question, doubt or suggestion, please mail me to deurus at deurus dot info or deurus82 at gmail dot com.